This ring was made on request for my customer - Ela. 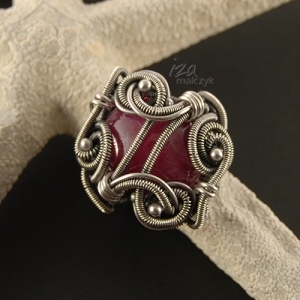 She's sent me this gorgeous polished ruby cabochon and asked for a ring similar to Medusa. I've closed the stone in a setting of fine silver in various shades - dark and bright. The crown of the ring measures 3.8cm by 3.4cm and is 1.7cm high. The ring is size 18.